Does Rantzer’s Convex Direction Theorem Sound the Death Knell for New Vertex Results in Robust Control? 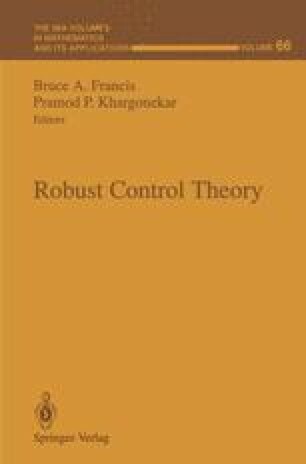 The legacy of Kharitonov’s Four-Polynomial Theorem are vertex results in robust control. At the heart of each of these is an associated vertex result for a convex combination of stable polynomials. Recently, Rantzer gave a so-called Convex Direction Theorem which seemingly sounded the death knell for finding new polynomial vertex results; hence, the search for new vertex results in robust control seemed at an end. The purpose of this paper is threefold. First, to introduce and review the literature on vertex results for convex combinations of polynomials. Second, to introduce the notion of convex directions and state Rantzer’s Convex Direction Theorem. Third, to pose and solve a parametric H ∞ problem in which the associated polynomial vertex problem fails to fit into the convex direction framework. This may help to dispell the conception that research in polynomial vertex results is dead and help spur new thinking. Much of the thinking and ideas presented in this paper are a result of my on-going collaboration with Professor Roberto Tempo of CENS-CNR, Politecnico di Torino, Italy. Indeed, Theorem 4.1 and the result quoted in Remark 4.1 is a joint effort. My thanks to Roberto, it is a pleasure doing research with him. This work was partially supported by NSF Grant 8858366 and by a NATO Senior Guest Fellowship spent at CENS-CNR, Torino. I also had the pleasure of conducting parts of this research while visiting the Automatic Control Laboratories at the Catholic University at Louvain, Louvain-la Neuve, Belgium and the Swiss Federal Institute of Technology, Zurich, Switzerland. I am grateful for their hospitality.